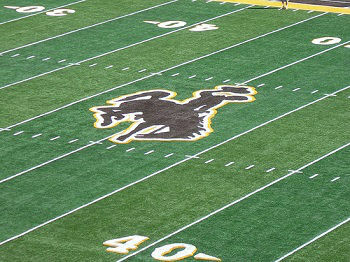 Preview: Wyoming has been stuck in the mud over the past few seasons and the fan base is hoping that head coach Craig Bowl can turn things around going forward. In his first year as the head man Bohl wasn’t able to bring instant success as the Cowboys went 4-8 overall and just 2-6 in conference play. After sitting 4-5 overall the Cowboys closed the 2014 season on a 3 game losing streak, including an embarrassing 14-63 loss at home against Boise State. The team should benefit from being more familiar with Bohl’s system, but the team will be hurt as they try to rebuild with just 10 returning starters back. The offense returns 6 starters and the unit will be playing with a new QB under center. The team hopes they’ll get a shot in the arm from former Indiana starting QB Cameron Coffman who showed flashes of solid play as a sophomore in 2012 with the Hoosiers. Coffman will work behind an O-line that returns 3 starters, including Chase Roullier who’s a great piece to build around. The Cowboys’ strength comes at RB where they boast a great duo with Shaun Wick and Brian Hill. The receiving corps is still in need of more depth, but the unit is happy to have guys like Gentry and Maulhardt back in the fold. Wyoming was very streaking on the defensive side of the ball in 2014 and this unit is in rebuild mode with only 4 starters back. The D-line figures to be the strength of the defense with 2 returning starters building around some guys that are ready to step up into starting roles. The D-line will look to all conference end Eddie Yarbrough to lead the way. The LB position is a complete overhaul with 0 returning starters and little in the way of proven players for the position. The LB position will look for guys like Wacha and Muhammad to step up and perform. The secondary returns 2 starters and there’s question marks surrounding the safety positions. Prediction: Wyoming continue their rebuild in year two under head coach Bohl who implemented completely new systems on both sides of the ball. With the overhaul there was some signs of hope in 2014 and the team is hoping to take another small step forward in their progression this season. The Cowboys will be going against a much more manageable non-conference schedule which could give this squad a boost in wins with a chance at reaching bowl eligibility.